Kitchens and bathroom renovations have become a core part of our business, so understanding tiles and the various styles available is a must for our team. One of the most popular styles of tile used in South Florida and beyond, is the Mexican tile, but there are many styles, shapes and colors of from this genre to consider when selecting these tiles. Our sponsor Rustico Tile is here is to break it all down for ya. Shall we? Mexican Tile is an all-around term for varieties of decorative tiles originating in various parts of Mexico. The most popular of which are Saltillo Terra Cotta, Talavera, Cantera and Cement tile. 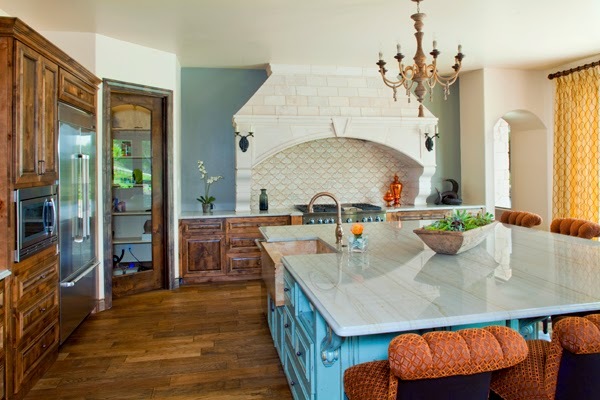 We will discuss how to incorporate all four into the modern home and help you decide what the best style of Mexican tile is right for your next interior design project. Below are some of the most popular uses for the tile we manufacture, some common areas they are found, and some new styles that you may have never known existed! The most popular type of tile under the Mexican tile umbrella is Saltillo tile, a handmade Terra Cotta tile originating in Saltillo, Coahuila, Mexico. Rustico Tile and Stone manufacture 3 styles of Saltillo tile which are most commonly used as floor tiles in an assortment of shapes and sizes. 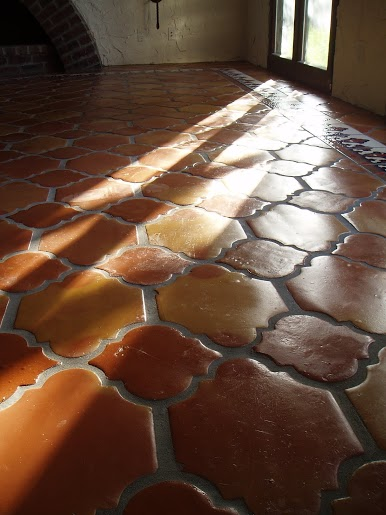 A traditional Saltillo tile varies in colors from terra cotta reds, orange, light and dark golden and cream colors. No two tiles are identical and they come with rustic characteristics. Think about the room where you want them installed. Do you have existing décor that will integrate well with these colors? Or do you have a more neutral space that can provide stark color contrasts against terra cotta tiles? In either case, traditional Saltillo would be a good choice. Traditional Saltillo tiles are such a popular interior design choice in the U.S today that locating a local store or online site where you will find traditional mexican décor and furnishings to match is easy. One of our favorites is Tres Amigos World Imports. Manganese Saltillo varies in colors from terra cotta shades we mentioned above to dark and light brown, gray, and can have black swirling. Overall, the general look of a manganese tile floor is light and dark shades of neutral colors with beautiful handmade characteristics. This makes it a great choice for a place in your home where you have a lot of bright color already and want to choose a tile that won't clash with those existing colors, while adding balance to the space. Even a modern-style home can benefit from rustic tile like this by allowing for light and dark contrasts. Or if you are going for a completely “vintage” look in the space, the manganese Saltillo would make a stunning choice mixed with antiques of your choosing. Antique Terra Cotta Tile is made to look like a reclaimed Terra cotta tile. 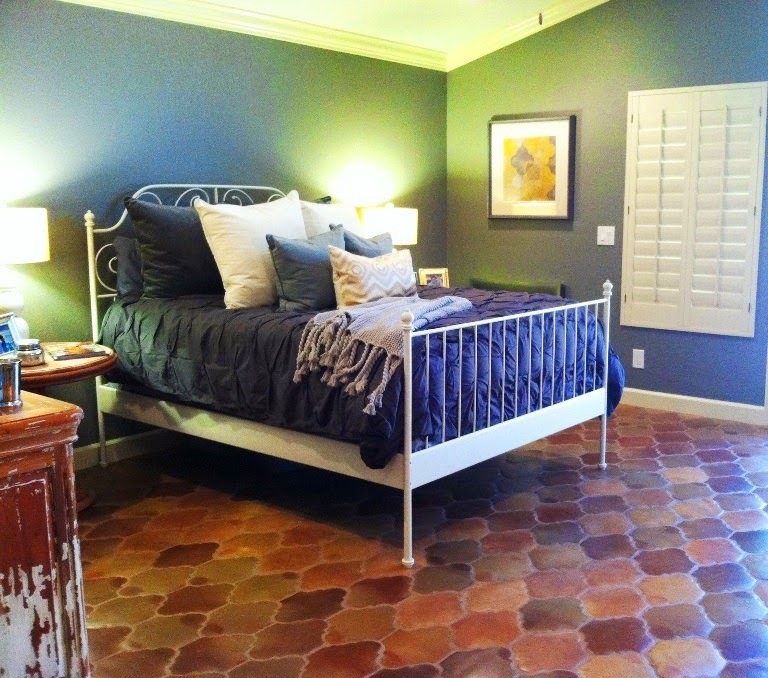 These are Saltillo tiles with added antique finish, texture, and look of old-world style floors. They can be manufactured in any size or shape. Here we have them used on a kitchen floor where there are other types of Mexican tile being used such as Cantera stone and Talavera, and they balance the room perfectly. The Antique Terra Cotta Saltillo is neutral even though it has an antique look. The colors are earth toned and are easily adapted in any modern space. The combination of new and old world style is achieved in the kitchen without sacrificing other lifestyle elements such as updated appliances. Since the tile is sealed, you don't have to worry about it getting wet and staining. Every piece of Antique Terra Cotta tile is hand-textured and it does not become slippery. 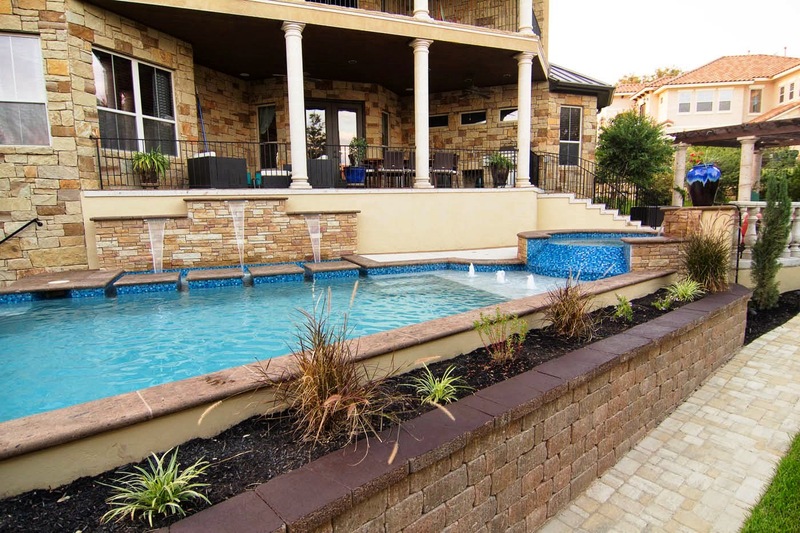 This makes it an obvious choice in wet areas, outdoor patios and even around pools where the design scheme is geared toward Hacienda or Mediterrean style. Another popular Mexican Tile product is created from Talavera ceramic. This hand-painted Talavera tile ceramic originates in the city of Puebla, Mexico where it was primarily used in pottery such as plates, bowls and jars dating back to the 16th century. 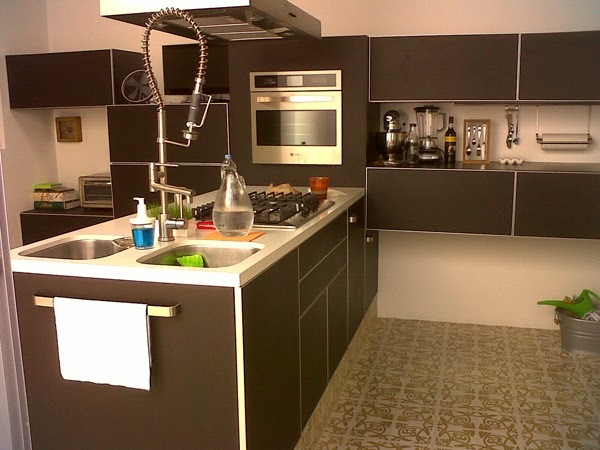 Talavera can also be used to make a ceramic tile which is used heavily in kitchens and bathrooms (in homes and restaurants/hotels) in Mexico. Once these decorative tiles are painted, the applications for Talavera ceramic tiles are endless - most commonly installed in kitchens as walls and counters. Because of its bright colors people can use this tile as an accent in the floor or wall or continuously throughout the space like kitchen backsplashes, enclosed showers and counters. When mixed with neutrals it really packs a visual punch! Here are a couple of the more traditional designs. See the difference? Although both options are beautiful, one is more modern while the other stays true to tradition and its artisan origins. Cantera stone is a unique stone that is mined in Mexico and Central America. It is the only stone that has properties of volcanic rock which makes it ideal for carving and cutting. This stone is so durable it can stand for centuries without fail! 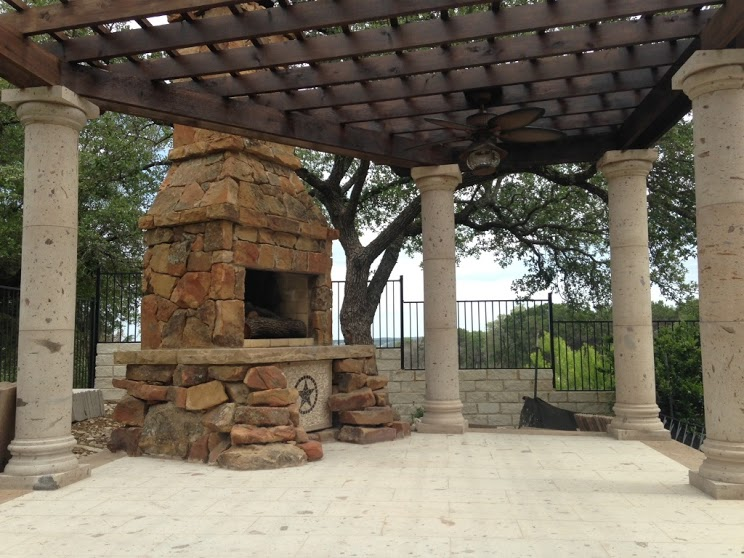 At Rustico, we custom create cantera columns, cantera fireplaces, stone fire place designs, stone fountains and outdoor water features, hand carved balustrade systems, cantera stone hoods, pool coping tile, window surrounds, door surrounds, cantera tile, outdoor pavers, and more! Cantera comes in many stone colors although traditionally a tan and natural stone color (Pinon cantera) has been a popular choice. 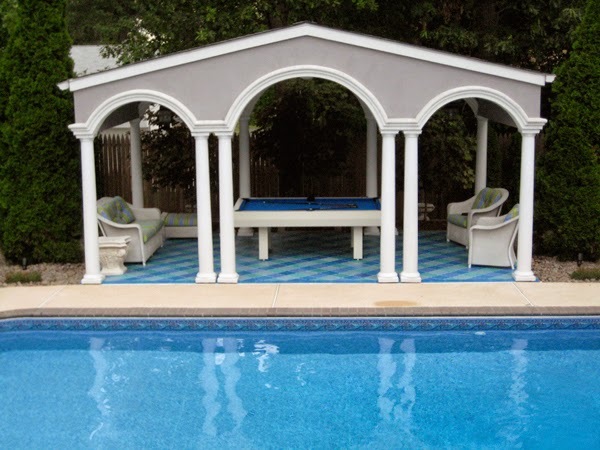 Here Cantera stone is being used for the columns around the home, as the pool coping tiles, and as the planter coping surround tiles (Tobacco Brown Cantera). A popular application for cantera stone is to be used as cantera stone tile as shown below in Lima Cantera. A unique approach to Cantera stone is seen in this hood. Using a white stone adds a contemporary, clean, feel to a rustic space and matches the white marble countertop. This is a beautiful display of beauty using light and dark contrasts. If you look back at the tan stone, you can see it’s a more traditional choice. Cement tile is the newest addition to The Rustico Tile and Stone product line and we are very excited to be manufacturing it. Cement tile is a durable, sealed solution replacing older style encaustic tiles which were made from clay, unsealed and thus not suitable for wet locations. 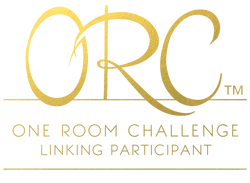 They are strong enough to be used indoors or outdoors, as floor tile, wall tile, backsplash tile, around pools, and as restaurant tile or hotel lobby tiles. Like Talavera, they are popular as accent tiles, but we've seen uses where they make up the whole floor or wall area. Are you looking to upgrade a commercial space? These are the perfect choice! Designers active on Pinterest and Houzz have been pinning this stuff like mad because clients can't get enough of the bold geometric prints and the durability they provide. Wet feet are no problem when you choose cement tile. These tiles are sealed and can be used around pools and kitchen sinks! In this example they create a “rug” effect in the cabana. 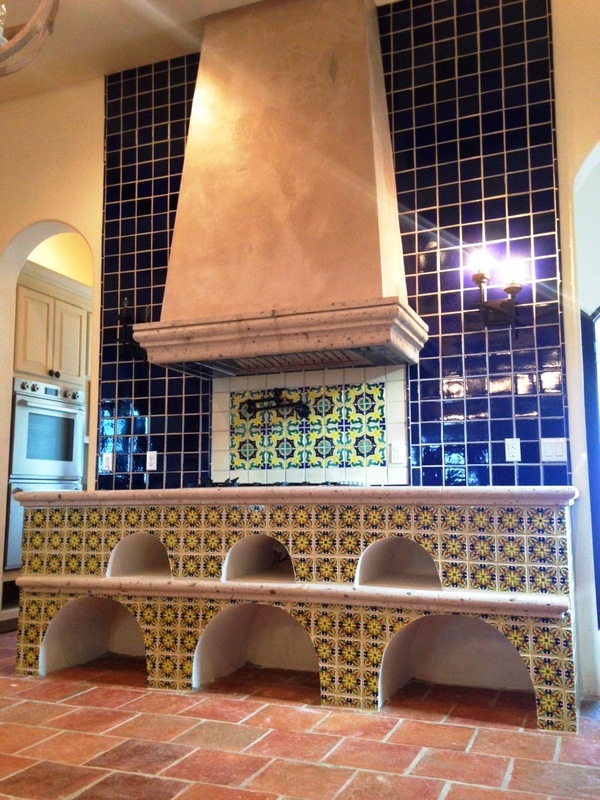 As you can see there really is no wrong place to put Mexican tile in your home, but there are some common applications. 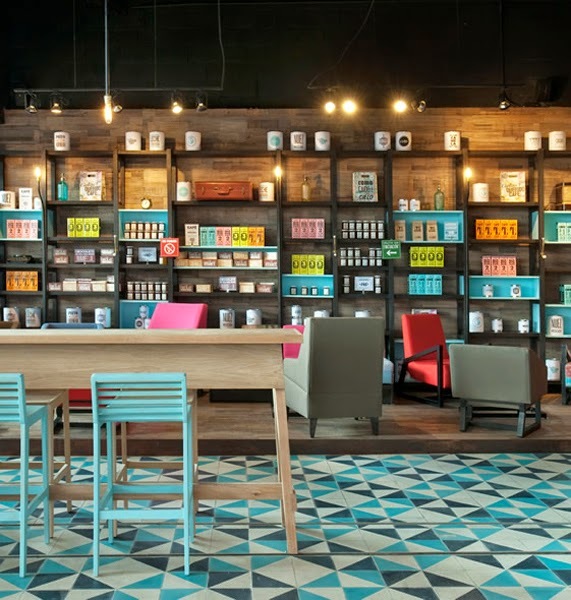 We hope these examples have provided some insight into how to choose the right Mexican tile for your next project and have inspired your design senses. I love an authentic thick terra cotta tile!! Just gorgeous!